There were some elements that were easy to eliminate, however. Since I don’t sell the deck through any distribution channels, I realized the ISBN number is kinda useless for me. So I decided not to register an ISBN for my second edition deck. That means that a bar code no longer needs to be on my box. For the interior, I still like how the top lid interior looks (above left) but I’m kinda meh about the bottom lid interior (above right). Switching it out, though, means now I need to figure out what to switch in. A superficial yet significant issue I learned from experience is when you make the box in solid matte black finish, it gets scuffed really easily and every minor ding is a contrasting, noticeable white. I’m reminded of what every single one of my black sweaters looked like back when my cat with white fur was still alive. Basically, it was impossible for me to look chic wearing black because I was always noticeably covered in cat hair. Anyway, I knew for this redesign, I had to go lighter, way lighter. To get a sense of what inspired my redesigned box, see above. 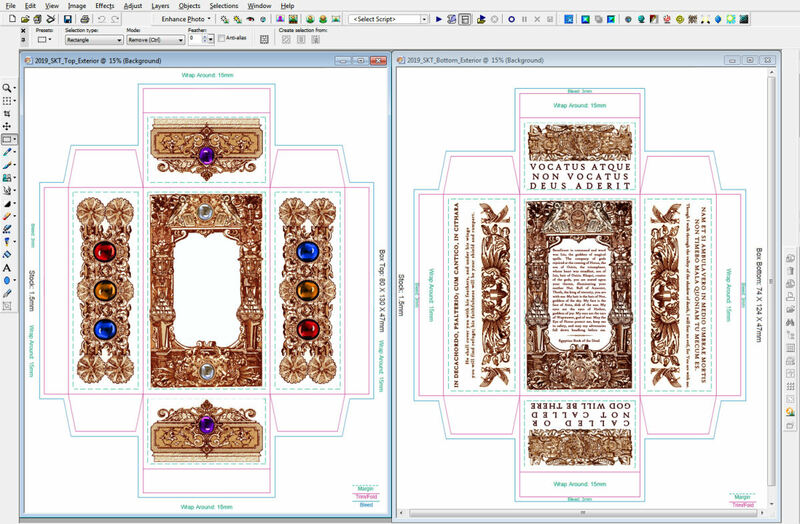 These are bejeweled covers to illuminated manuscripts and I was hoping my redesigned box would have a similar vibe. These are my works in progress. The background probably won’t be solid blank white. I haven’t layered in the background yet. Right now I’m just focused on trying to figure out the main design. Also, the hues of amber for the top lid (above left) and bottom lid (above right) shouldn’t be different– something wonky happened there and I’ll fix it so it’s the same shading before these files go to print. And now for the interior of the box lids. Most of it is still a big question mark. But with the total lunar eclipse coming up this weekend and a full moon in Leo (my moon sign! 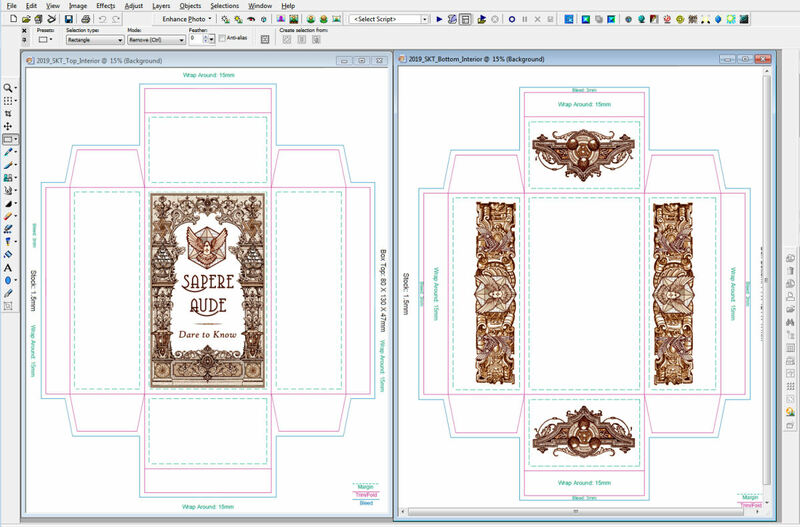 ), I’m going to devote the eclipse period to working on the box design. By next week, I should have something finalized. By the way, pre-orders are now open and will remain open until March 20, 2019. I’ll be producing a quantity based on that pre-order, which means no rush– the decks won’t “run out” before the close of the pre-order period– but, it is a limited edition because after this print run, I won’t be making any more of these. I’m going to be moving on to other projects. I don’t want to get into the business of being a deck creator or deck seller. I have pre-ordered mine already I’m so happy!!!! Just waiting on my confirmation email from you guys, I’m so excited it looks so beautiful!! I’m very happy that a lot of things are different from the first edition but still following the same overall theme, it just feels good that we both have a chance at something truly unique!! I’m sure this weekend will be most productive, best of luck!!! And thank you so much! This second edition is so beautiful, and I just know that the ending box design will reflect that. I get it though about the meaning and symbolism from the first box and not wanting to let that go. Take care! I’m so excited about your supercalifragilistic new Vitruvian SKT !!! I just placed my order, yippee. This feels like my favorite B’Earth-day all over again (when I turned 10 in Argentina)! I am sure all of us feel the same way – totally appreciative of all the loving and Magickal details that you put into this Sacred Work that you are gifting the World. Bless you!